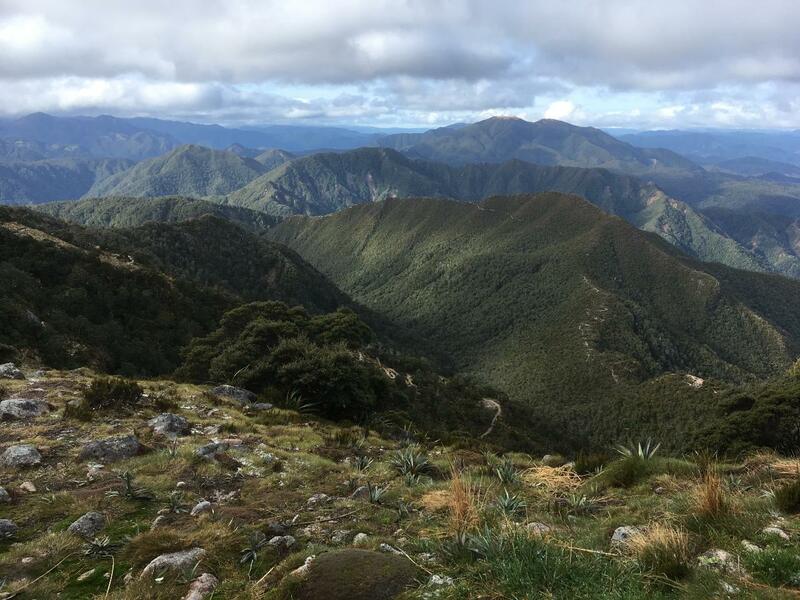 Day One – Nelson to Lyell Saddle Hut, 18km, 4-6 hours. Early pick up at accommodation in Nelson and travel by minivan to Lyell Carpark (beginning of the track) for a final briefing and the start of your walk. We begin with a steady grade on the old benched track climbing to the Lyell Saddle hut (885 metres above sea level). Beech forest dominates this track as we ascend through the clouds to emerge at the hut with beautiful views over the valleys. Day Two – Lyell Saddle Hut to Ghost Lake Hut, 12km, 3-5 hours. 6 km of graded climbing through cloud forest up to the tussock tops of the Lyell Range. Then it’s 6 km of relatively level open-tops travel to ‘Ghost Lake’ and the stunning Ghost Lake Hut. Unparalleled views of pure South Island majesty are yours with every stride. we will be spending lots of time exploring the tops today as we have a shorter day and this section is particularly amazing. Day Four – Stern Valley Hut to Specimen Point Hut, 25km, 7-8 hours. With various destination options this day (including intermediate but more basic hut sites at Goat Creek and Mokihinui Forks), it’s on up Earnest Valley (north branch of Stern Creek) and through the strange but gorgeous open meadows of its catchment. At the twin lakes (Lake Grim and Lake Cheerful), the track switches back into climb mode through the ‘Boneyard’ heading for ‘Solemn Saddle’ and then leads on down through ‘The Hanging Judge’ into the headwaters of the Goat Creek catchment. Scrub and grass covered valleys form the way until the final couple of kilometres through bush to the historic Goat Creek Hut. Stern Creek Hut to Goat Creek Hut 14 km; 3-4 hours. From Goat Creek Hut it’s 8 km of flat walking down through the beautiful podocarp forest of the Mokihinui River South Branch to the Mokihinui Forks Hut (2 -3 hours). Then just a further 3 km, 1 – 1.5 hours down to the Specimen Point Hut settlement at the head of the mighty Mokihinui River Gorge. Day Five – Specimen Point Hut to Welcome Bay/Seddonville, 17km, 4-6 hours. Undulating walking as The Old Ghost Road picks up the old miners’ track hugging the true left bank of the mighty Mokihinui River gorge with stunning river views. Our van meets us at the Rough and Tumble Lodge from where we transfer you back to Nelson, with stops for lunch and afternoon tea on the way home.